Dell’ Arca, an exciting recruit to British racing brought up a 1,331.5/1 treble for trainer David Pipe when taking another exciting renewal of the £100,000 StanJames.com Greatwood Hurdle. A four-year-old who was bought at auction in France earlier this year by trainer David Pipe, Dell' Arca carried the colours of Dorset-based Professor Caroline Tisdall, a relatively new owner to the yard, but a woman with a passion for Jump racing. Dell' Arca cost her £280,000, but recouped about a fifth of that today, and there is every reason to believe there is more to come. He flew the last hurdle, belying his relative lack of experience, and galloped on determinedly to beat Sametagal by half a length. Another length and a quarter back in third was Rawnaq. Pipe said: "He had some decent form in France and cost a lot of money, but we put him in at the deep end because we felt he could run well off a mark of 128. 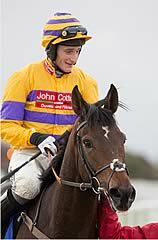 Tom [Scudamore] gave him a great ride and the horse travelled and jumped so well." Pipe admitted Dell' Arca has not been off the bridle at home, but he was in no mood to talk of Festival dreams. He said: "He's still a novice, but we'll just enjoy this. You never get an easy race at this meeting. My only plan is the M5 journey home this evening. "He'll have entries in all the big handicaps, but we won't get carried away. All routes are open. "This meeting means a lot to my family and we regard it as second only to the Festival in March, but we hadn't had a winner after the first two days. It is great to be in the winner's enclosure." Caroline Tisdall is a Professor of Art History at the Courtauld Institute in London, an author of some 13 books and has worked on films for the BBC and Channel 4. She said: "I was very keen on racing as a young woman, but then life and men and work and lack of money got in the way, but now we are back where we started. "This feeling is indescribable, and to think that jump racing exists in our modern world and health and safety climate is a miracle. I just wanted to join in and keep it going in my own little way. I love the Pipe yard and am very happy there. "This is the most expensive horse I've bought and I'm not going to make a habit of it, but it was the one occasion when David Pipe had a chance to outbid Willie Mullins at public auction [Mullins was underbidder for Dell' Arca]. After the sale Willie invited us over to Ireland for a stable visit, which was a nice story of its own." Tom Scudamore, the successful rider on 12/1 winner Dell'Arca, said: "He has been pleasing us at home, doing everything right but it is a different thing doing it on the track. "I was always very confident. He has had only three runs before in his life, but has taken to hurdling like a duck to water and was always jumping and travelling today. 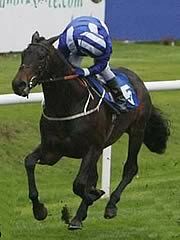 The jump at the last won it but what a brave horse to win first time out in a race like this was outstanding. "What a performance, what a credit to the horse, what a credit to everybody behind the scenes to come out and win a competitive hurdle like that. He has won an 18-runner two-mile hurdle around here and shown plenty of guts. "From the last, he really knuckled down. Coming to the last, we needed a big one and he responded. I was able to get the gaps I wanted through the race as he was always travelling nicely. "It was really, really exciting, just fantastic. He has won today off 128 by half a length and is probably a 130 horse but it is just his attitude more than anything. He wants to battle, he wants to fight and he loves his racing. 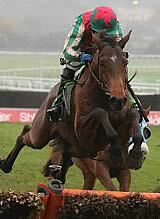 He has won one of the best handicap hurdles in the country, which for a four-year-old is an extraordinary performance." Stan James gave Dell’ Arca a 33/1 quote for the Stan James Champion Hurdle back at Cheltenham in March. Trainer Paul Nicholls was sanguine despite suffering another narrow reverse when 8/1 shot Sametegal was edged out by Dell’ Arca in a thrilling finish at Cheltenham this afternoon. There were three horses in line jumping the final flight and the winner, the runner-up and third-placed Rawnaq went toe-to-toe in the closing stages, with the David Pipe-trained gelding just getting the better of Nicholls’ four-year-old by half a length. “We knew there was something lurking at the bottom of the handicap as we all wanted him (Dell’ Arca) at one point," said Nicholls. “I’m very happy with his performance though. We were going to go chasing with him but he’s only a four-year-old and I think that can wait for another year. “We’ll see how he is when we get home but he’s got plenty of options and we’ll look at races like The Ladbroke (at Ascot) for him." County Meath trainer Matthew J. Smith, who has eight horses in his yard and has only had his licence for a year, was delighted with the performance of 20/1 shot Rawnaq. It was a family affair for the Smiths as Matthew’s brother Kevin rode the horse and the trainer expressed his desire to return to Britain for another crack at a big pot. “We’ve always thought a lot of this horse and were expecting a big run from him," said Smith. “We thought he’d run a big race in the Galway Hurdle but he came back very sick after that run so we’ve given him a break since then and he’s shown exactly what he can do here. “They got a bit close on the run-in and maybe he was left in front a little too soon after that horse fell (Ahyaknowyerself) as I think he idled a bit. “Hopefully he’ll come back right and if he does, we’ll look at that race at Ascot (The Ladbroke) for him as I think he’ll run another big race there."